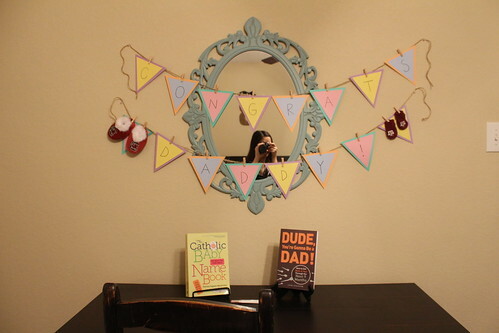 After I saw the positive pregnancy test really early on a Saturday morning (I think it was around 6:00am), I started setting up a little surprise for Jeff. I'd had all the supplies ready to go for months, so it felt very surreal to actually be getting everything ready! 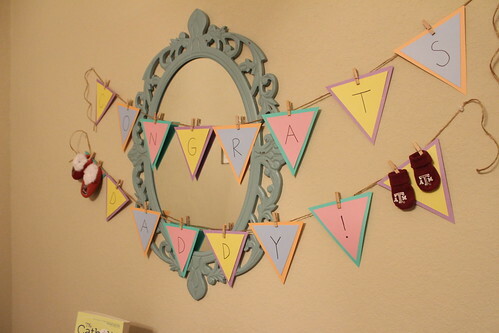 I hung a banner that said "Congrats, Daddy!" 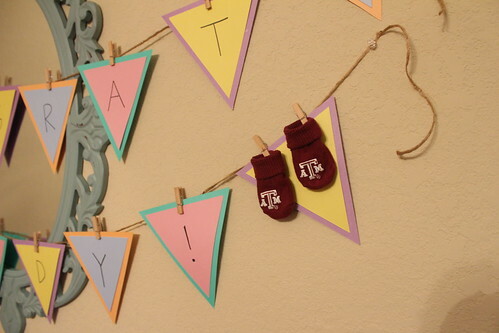 on the wall in the future nursery, and I clipped little South Carolina Gamecocks and Texas A&M Aggies baby booties on either side. 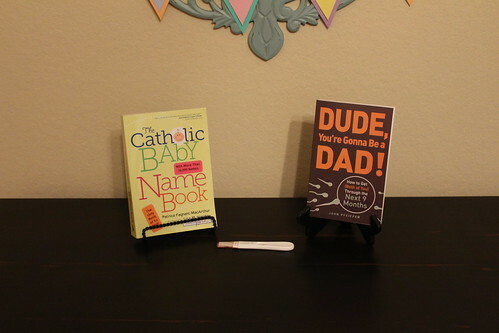 Underneath the banner, I set up a couple books - Dude, You're Gonna Be a Dad and The Catholic Baby Name Book - and I put the positive pregnancy test on the desk with them. I was intending to just wait until Jeff woke up and then tell him I wanted him to see something upstairs, but by 7:30am I was getting really impatient, so I decided to go wake him up. I knew I'd have to have a good reason to get him out of bed and upstairs so early on a Saturday, so I woke him up and told him that our wi-fi wasn't working, and that I needed him to come fix the router (our wi-fi router is in a closet in the future nursery). Jeff came upstairs with me, and when we walked into the room I just pointed at the wall with the banner. Eventually he looked at the pregnancy test and said "We're gonna have a little! Yeah!" and did a little celebratory dance, so I did end up getting the excited response I was hoping for! Then he read the entire Dude, You're Gonna Be a Dad book the next week on a business trip, so for the first few weeks of the pregnancy he was much more informed about what was going on with my body than I was! So cute! 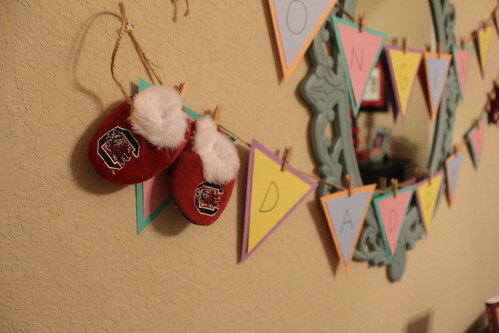 I love the little collegiate booties. I love how you told him...and his reaction seems very similar to how my husband is in the morning when I try and tell him news before he is totally awake. So happy for you!